[150 Pages Report] The connected logistics market is estimated to grow from USD 10.04 billion in 2016 to USD 41.30 million by 2021, at a Compound Annual Growth Rate (CAGR) of 32.7% during 2016–2021. The base year considered for the study is 2015 and the market size forecast is from 2016 to 2021. Connected logistics is an interdependent set of communication devices, joints, and Internet of Things (IoT) technologies that change the key logistical processes to become more customer-centric by sharing data, information, and facts with the supply chain partners. The market for connected logistics is still nascent and can be defined as interconnected devices that logistics and IoT solutions providers use to get more visibility within warehouse, transportation, and associated logistics processes, such as order processing, financial transactions, shipping, and dispatching & picking. It helps drive more effective business decisions by identifying the crucial bottlenecks and hence, facilitates in critical decision-making. 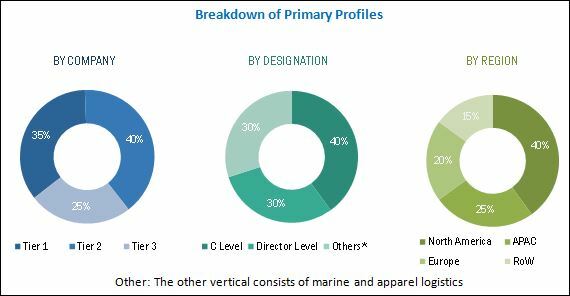 To define, describe, and forecast the connected logistics market on the basis of five regions, namely, North America, Europe, APAC, Middle East and Africa (MEA), and Latin America. To strategically analyze each sub-segment with respect to individual growth trends, future prospects, and contribution to the total market. To analyze the opportunities in the market for stakeholders by identifying high-growth segments of the connected logistics market. To strategically profile key players of the market and comprehensively analyze their core competencies in the market. To track and analyze competitive developments, such as new product launches, mergers & acquisitions, partnerships, agreements, and collaborations in the global market. 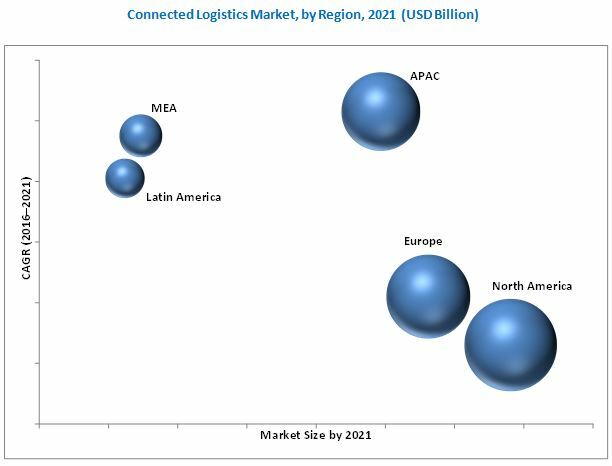 The connected logistics market ecosystem include technology vendors such as AT&T Inc. (Texas, U.S.), Eurotech S.P.A (Italy, Europe), IBM Corporation (New York, U.S.), Intel Corporation (Santa Clara, U.S.), SAP SE (Walldorf, Germany), Infosys Limited (Karnataka, India), Cisco System Inc. (California, U.S.), HCL Technology Limited (Noida, India), ORBCOMM (New Jersey, U.S.), Cloud Logistics (Florida, U.S.) and Freightgate Inc. (California, U.S.) among others, which provide numerous IT and non-IT components required for connected logistics software and platform as well as consulting, integration and deployment, and support services to connected logistics platform. In January 2017, Intel partnered with Honeywell to develop an IoT-based retail industry solution; this collaboration would majorly focus on enhancing supply chain efficiency and increasing profitability by improving product visibility. The new designed solution will be in-built with tracking, monitoring, and security access of moving goods. Hence, the challenge is to ensure a better inventory accuracy and enhance customer services. In December 2016, Under Bluemix platform, IBM launched DevOps and continuous delivery services. These new services under app development process would help in creating, developing, and integrating a DevOps services toolchain. In October 2016, HCL Technologies acquired Butler America Aerospace LLC (Butler Aerospace), a provider of engineering, design services, and aftermarket engineering services to the U.S. Aerospace and Defense customers. This acquisition would enable HCL Technologies to bolster its capabilities in aerospace and access to clients with large R&D spends. The connected logistics solutions and services offer a pro-active and real-time monitoring of supply chain activities specifically logistics and warehouse related activities, providing comprehensive control over various tasks in the supply chain ecosystem. The security solution is growing rapidly owing to the increasing adoption of IoT logistics solutions and growing security concerns. The connected logistics market is broadly classified into software, platform, service, transportation mode, verticals, and regions. The software segment is further divided into asset management solutions, warehouse IoT solutions, security solution, data management, and network management and streaming analytics. Compared to solutions, the services segment is expected to grow at a higher CAGR during the forecast period. The services in the market are aimed at enabling smart and coordinated decision-making processes and mitigating the risks and vulnerabilities of Internet of Things (IoT) in logistics using efficient tools and techniques. Moreover, these services enhance data management techniques and help to meet the end-to-end needs of all the verticals. The security solution is expected to grow at the highest CAGR during the forecast period, as it is specifically focused on data security, which is the prime need of logistics companies. As IoT solutions offer an extremely connected system, data security solutions make sure all the data is secure. Rising incidents of data theft and data tampering have urged companies to purchase security solutions thereby causing them to grow at a high rate as compared to other solutions. With the increasing usage of numerous devices across enterprises, various advanced threats have also evolved and the need to maintain the safety and confidentiality of data has become crucial. Due to the large number of devices connected in a connected system, tampering with even a single device in the network can turn out to be a potential threat for the company. Connected devices need a dedicated security solution as this need cannot be met by PC security solutions for IoT embedded devices. Applications areas in asset management, warehouse internet of things, data management, and network management drive growth in connected logistics market. Asset management solution is safe, reliable, substantial, and an efficient approach to manage the entire logistics facility. It includes route plans for resources, timescales, route asset strategies, & a detailed plan to optimize the delivery of renewals, maintenance, and enhancement. Asset management solution assists freight and infrastructure managers to address issues, such as improvement in service availability performance & utilization for mobile, fixed, reducing service failures & delay minutes, and minimized asset costs. Asset management includes all the systems, procedures, methods, and tools to optimize performance, costs, & risks for the entire infrastructure lifecycle. The system helps reduce the operational cost of infrastructure assets and ensures top-notch performance, which elevates the reliability upon the service. The increasing integration of ICT and IoT has provided transportation and logistics industry, a new opportunity to automate equipment & infrastructure for improving the operational efficiency. The influence of IoT has changed the trend of the logistic industry by impacting warehousing operations, freight transportation, and timely-delivery. The prime shift has taken place in the transportation and logistics operation transparency. Today, logistics system has become transparent and hence customers have a complete visibility to track shipment details in real-time, forcing logistics companies maintain high quality of goods and shipping condition throughout the supply chain. Network management solution manages the entire network of an organization and ensures 24/7 IT services for users. These IT solutions manage, optimize, & analyze logistics networks, including production house, warehouses, and goods distribution centers for retailer & transport. For connected logistics, IoT solutions comprise portable devices that support different wireless technologies and communication protocols. These devices cover large area and functions, even in harsh environments. Hence, these devices need continuous monitoring and controlling to ensure smooth business operations, product security, and employee safety. The network management solution also assists in data analysis, while transferring over a network and automatically routes them to avoid congestion, which could cause network crashing. With the help of a network administrator, the solution can easily detect network failures and resolve issues in real-time or by informing the support personnel. In transportation & logistics applications, a fast and seamless data transfer is required. Therefore, the network management solution offers many benefits, such as better network connectivity, reducing rates & transportation costs, saves time & improves transportation service to boost customer satisfaction, and safety & security. What are the upcoming industry applications catered by IoT operating systems? Lack of uniform governance standards is a major restraining factor for the growth of the connected logistics market. However, the recent developments such as new service launches and acquisitions undertaken by the major market players are expected to boost the market growth. The connected logistics market is growing rapidly and is being widely accepted across the regions. The solutions and services that connected logistics offers are proving to be very efficient for getting optimum production with minimal utilization of the resources. There are several established players in this market such as AT&T, Inc., (Texas, U.S.), Eurotech S.P.A (Italy, Europe), IBM Corporation (New York, U.S.), Intel Corporation (California, U.S.), SAP SE (Walldorf, Germany), Infosys Ltd., (Bengaluru, India), Cisco Systems, Inc., (California, U.S.), HCL Technologies Ltd. (Noida, India), Orbcom Inc. (New Jersey, U.S.), Cloud Logistics (Florida U.S.) and Freightgate Inc. (California, U.S.).